Turtle Arena is a free and open source cross-platform third-person action game using the Spearmint engine. Turtle Arena is multiplayer oriented with multiple game modes that can be played in splitscreen, over a network, and with bot players. The Turtle Arena website moved from turtlearena.com to clover.moe/turtlearena See the blog post for details. 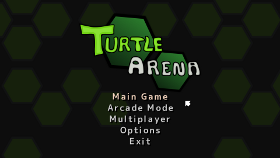 Turtle Arena 0.7 is now available for download. See the blog post for details. Added HTTPS support and redirects for news feed and web pages at ztm.x10host.com/ta/*.htm to https://turtlearena.com. I made some minor website changes and so that it is accessible via turtlearena.com. Turtle Arena 0.6.1 is now available for download. See the blog post for details. Turtle Arena 0.6 is now available for download. See the blog post for details.